Treat yourself! The Spanish word for this dance and music means 'the sweet dessert'. Sweet, appealing and fun! Sparkling diamonds highlight white gold settings riding the wave of matted yellow gold. 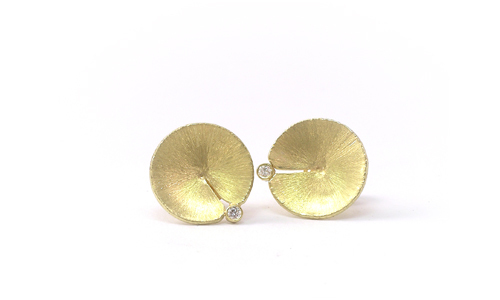 Hand-crafted ear studs, joy and precision in 18k gold. Two perfect diamonds of 0.16 carat in F/vs quality. Take a luscious taste in opulence, like plump fruit nurtured by the sun, these natural freshwater pearls are sure to please the kings. A Dynasty in harmony with pearls elegantly suspended under shimmering golden disks, encircled with a golden vein and crowning diamonds at their center. 18 karat gold, diamonds, 0.05ct F/vs. pearls. What a perfect composition! Wear Diamonds by day, add fine Garnets to make it your special night out. 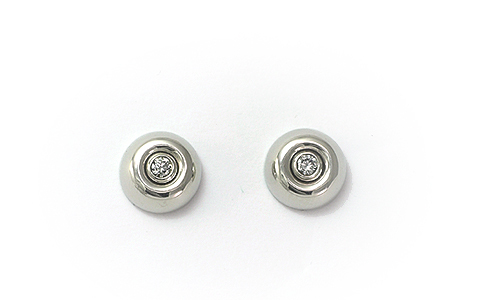 Diamond studs in polished white gold (0.16ct F-vs2. 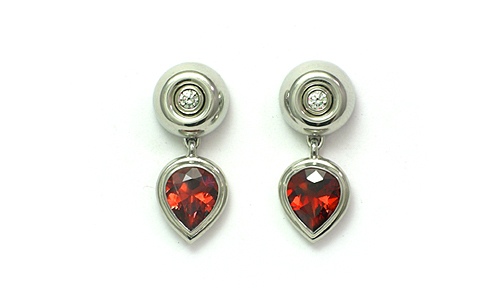 on their own $1,490) paired with faceted Sri Lankan Garnets ( 3.23ct add $860 ) all in 18 karat white gold. Find sweetness in life! 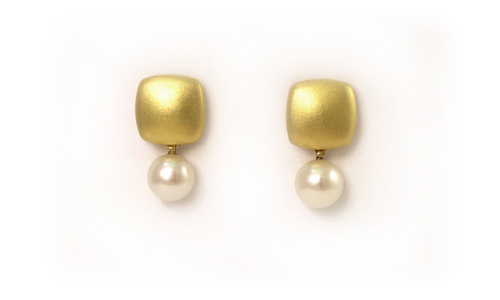 Gorgeous like gold itself, these softly textured ear studs can be worn as a glowing statement on their own, or attach their freshwater pearls to face the music and dance! 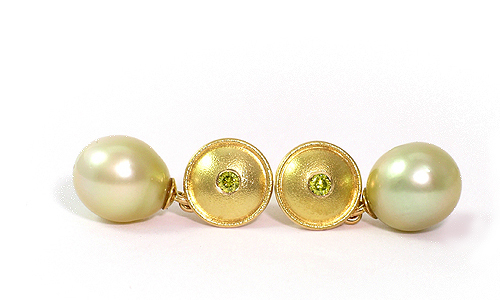 Gold 18k, fine pearls, detachable. Where everyone passes by goes "ah"! Brazilian Nights and starlit Diamonds on fresh Tourmaline combined for the beautiful nights out. Wear diamond studs ( 0.62ct G/H Si1 $2,890 ) on their own or paired with Brazilian Tourmaline (18.73ct $1,960 ) detachable, all in 18 karat white gold. What transforms an ordinary day? Glorious Diamonds on black pearls for sure. Wear shining diamond studs on their own 0.62ct G/H Si1 for $2,890 or paired with Tahitian Pearls $890 from the deep turquoise waters of French Polynesia, easy detached for flexibility, all in 18 karat white gold. Be reminded of a sweet first kiss or recall special memories with these classically stylish earrings. 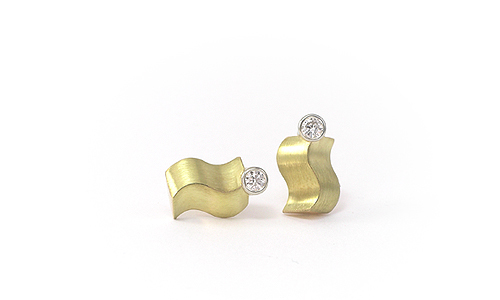 Fine white diamonds are gypsy set in gently curved yellow gold. Simply stated sophistication. 18 karat yellow gold, diamonds 0.12ct. 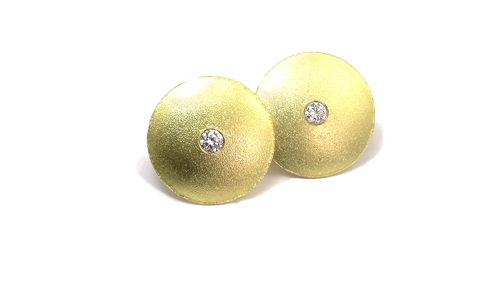 Floating on the South Seas, gazing at the stars you might see these earrings. Fine, light green diamonds are gypsy set in gently curved 18 karat yellow gold. Exquisite natural green South Seas Pearls dance with your every movement. Diamonds 0.12ct. What separates good ear studs from the best – or the worst? Ear studs are a staple in everyone’s life now. Only, they get lost. Backings fall through the sink holes and sweaters pull off the best parts before you know. What can be done? Safety measures may depend on your earrings’ value or your appreciation. At the Martinus Studio we use strong stud posts and the strongest butterfly backings possible. Often overlooked are the earring posts snap-notches. They have to fit the curve of their particular backing spring exactly. That takes care of many early morning search stresses. 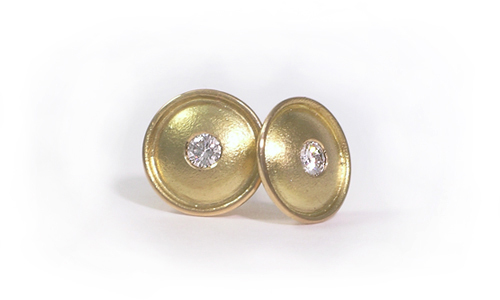 If you need it safer; let’s say for the girl’s best friends, the big diamond studs; choose French Alpa backings. These unique click-in super stopper mechanisms are my favourites. Most of my talk is technique here, but have a look at the beautiful styles we have for you!